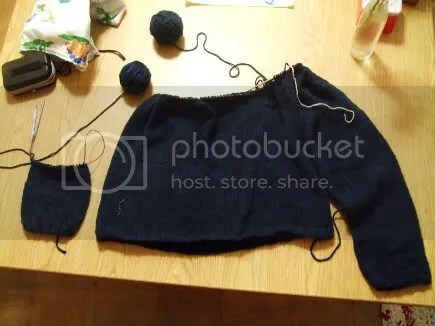 Sweater Progress | Stitch, Brinn, Stitch! This post is a bit late in the day, but still on today, so my NaBloPoMo record is still good. I finished a sleeve and attached it and am currently working on the second sleeve. I seem to have misplaced my last skein of yarn, so I’ll have to locate that before I get too much farther along, but I think it’s possible I might have enough yarn. Maybe. Hopefully.